Space technology is a crucial component in bushfire monitoring. Its impact can be clearly seen through the North Australian Fire Information (NAFI) website. 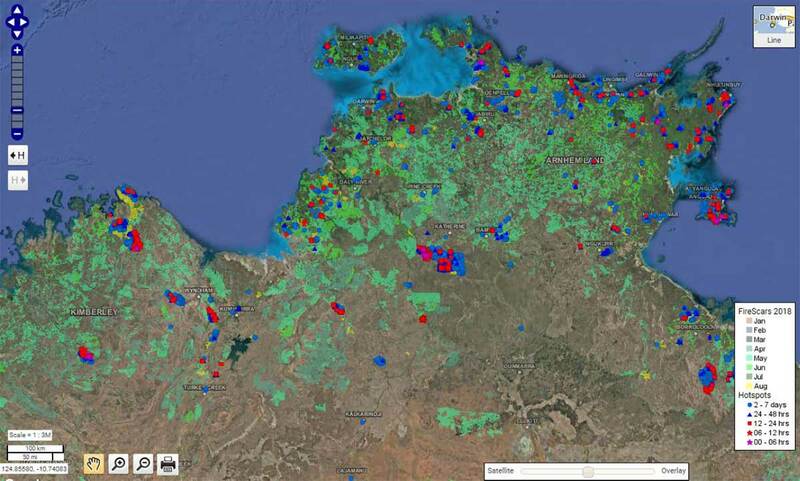 This tool was launched in 2004 and has been instrumental in managing and controlling the spread of fires in Northern Australia, encompassing Northern Western Australia, the Northern Territory and Northern Queensland1. NAFI collates bushfire information such as hotspots (fire locations), recently burnt country (fire scars), and fire history. The fire scar mapping is sourced from the Darwin Centre for Bushfire Research at Charles Darwin University. This fire scar and hotspot information is based on NASA satellite images sourced from a combination of ground stations around Australia and processed by Landgate and Geoscience Australia. NAFI contributes to the generation of significant economic benefits to northern Australia through better protection of infrastructure and property from fire, and via more effective and streamlined use of resources in fire control. It is also a crucial tool for Aboriginal land managers, ranger groups, and pastoralists in securing carbon credits via savanna burning projects. Early dry season burning has numerous environmental and safety benefits and the carbon credits earned from this activity are currently worth around $20 million a year, with significantly greater value generated in the form of indirect social and economic benefits2. NAFI is constantly evolving, and is planning to incorporate satellite remote sensing for the level and intensity of fires through savanna regions, providing annual mapping of fire severity for fire managers.